we are Leading supplier of Rotary (Screw) Compressor Replacement / Compatible spares suitable for Atlas copco, Ingersoll-Rand, ELGI, Kaeser, Chicago Pneumatic etc..
We are successfully ranked amongst the topnotch entity offering a wide range of Compressed Air filters Suitable for Atlas copco, Ingersoll-Rand, ELGI, Kaeser, Chicago Pneumatic, Boge, Gardner denver and other Imported screw compressor. These Compressed air filters are equipped with general operating pressure filter counting 0.7~1.0 Mpa. The initial differential pressure of oil separator filter is 0.15~0.25 bar. In addition, the separators deliver a working pressure of ≤120°C. 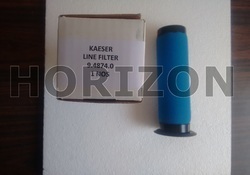 Kaeser Line Filters OEM Part No. Our firm has gained continuous appreciation as the prime organization offering of Line Filters. The filters are designed to bridge the gap between conventional elastomer seals and mechanical face seals. The offered filters provide lower friction and generate less torque, less heat, and require less power. These filters find wide applications use in conveyor rollers, electric motors, rolling stock, generators, compressors, and vacuum pumps. Besides, clients can get the filters from us at industry leading prices. We are successfully ranked amongst the topnotch entity offering a wide range of Replacement Compressed air filter element of Zander. 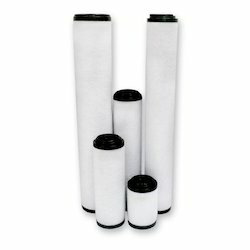 These Line filters are Ideal for removal of Oil, Moisture, dust particles around 0.01 micron with great efficiancy. We are successfully ranked amongst the topnotch entity offering a wide range of Replacement Compressed air filter element of Ultra filter. These Line filters are Ideal for removal of Oil, Moisture, dust particles around 0.01 micron with great efficiancy.